The Honorable Minister of Justice Edson Kirindongo continues his work to regulate the status of all civil servants working within the Justice Ministry, one of his main tasks he has pledged to comply with. 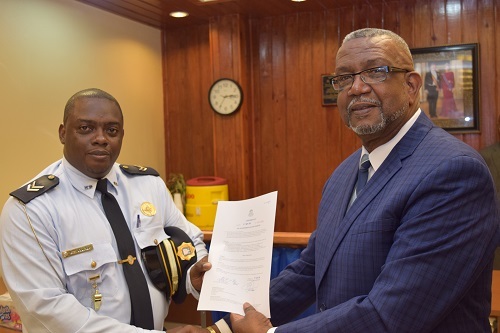 On Friday September 23rd during a short ceremony at the Philipsburg Police Headquarters, in the presence of the Chief of Police Carl John, the management team and other colleagues, the minister handed out a total of 22 decrees (landbesluiten) to officers working within the Justice Ministry. The decrees that were handed out were for promotions, rectification of salary and years of service. The minister congratulated all who received their decree and stated during a short speech that he is very proud of the work everyone is doing and look forward to continue to work with. He also stated that we should look out for and take care of each other because we all are here for one common goal which is to serve and protect the community of Sint Maarten. Election SXM St Maarten Last Lap! Photos, Videos, Live Feed, Live Commentary!